Photo MCRC-4.1. Foot patrol down stream. No date or caption. Another spontaneous candid shot of what looks like pretty miserable duty. Photo MCRC-4.2. Foot patrol approaching settlement. Somewhere near the Honduran border. Photo MCRC-4.3. 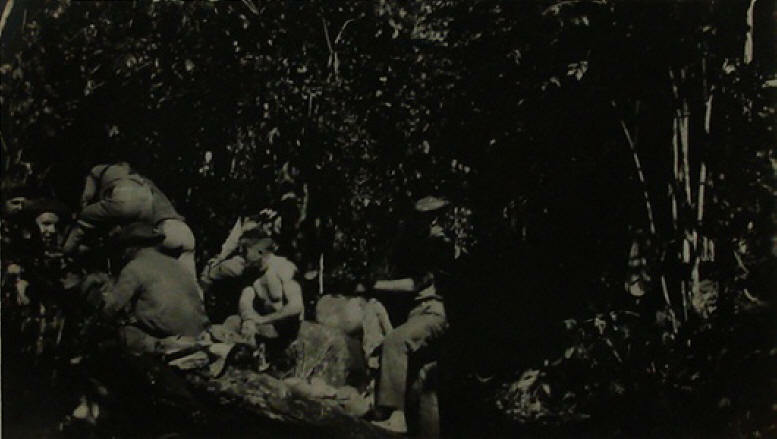 Marines resting on log along trail. On break on patrol; looks like lunch. Photo MCRC-4.4. 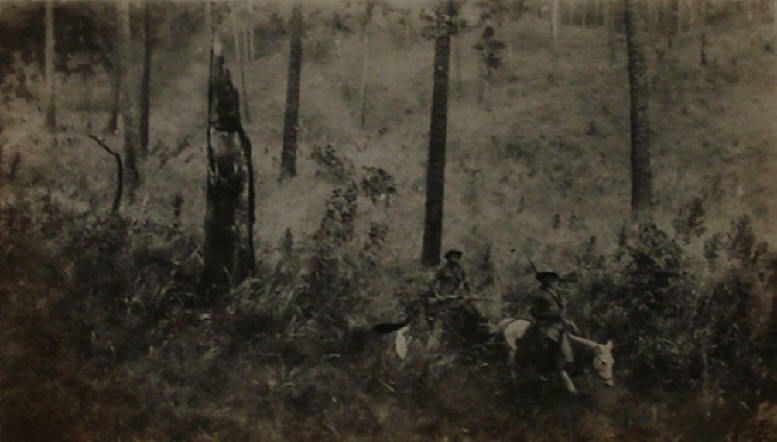 Two armed mounted men in open forest. 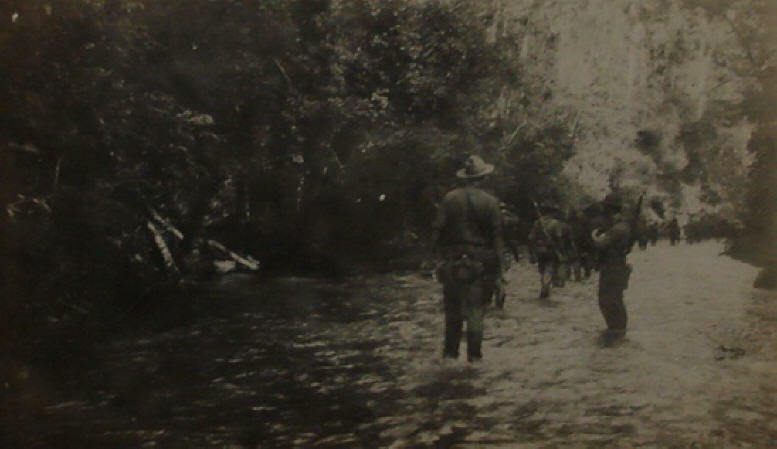 Probably somewhere near Dipilto; these don't look like Marines; is the person on the left a woman? Conveys a good sense of much of the landscape in the Western Segovias. Photo MCRC-4.6. 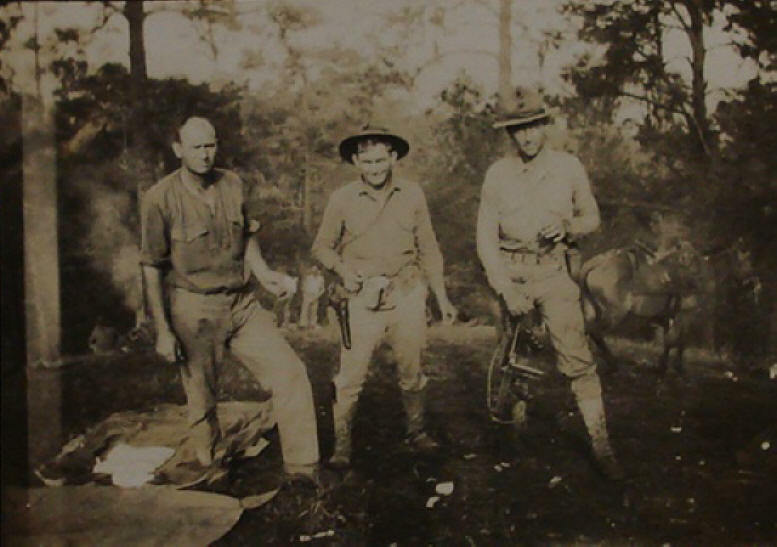 Three Marines in camp. A nice image. Marine at right cradles the muzzle of a Thompson sub-machine gun. Photo MCRC-4.7. 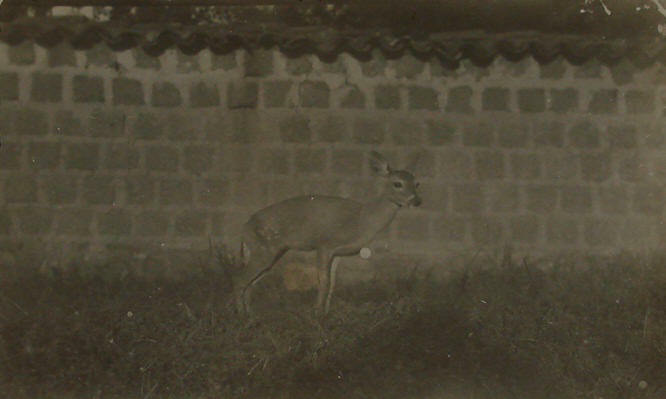 Betty the Deer, Mascot of 50th Co., Somoto, August 1928. "Betty" Mascot of 50th Company, Somoto, Nic. Aug 15, 1928." Photo MCRC-4.8. Gathering of citizens, Somoto. Be wonderful to know who these people are. Quite a few people here barefoot, along with what look like local eminences. Neither caption nor date. Pity. Photo MCRC-4.9. 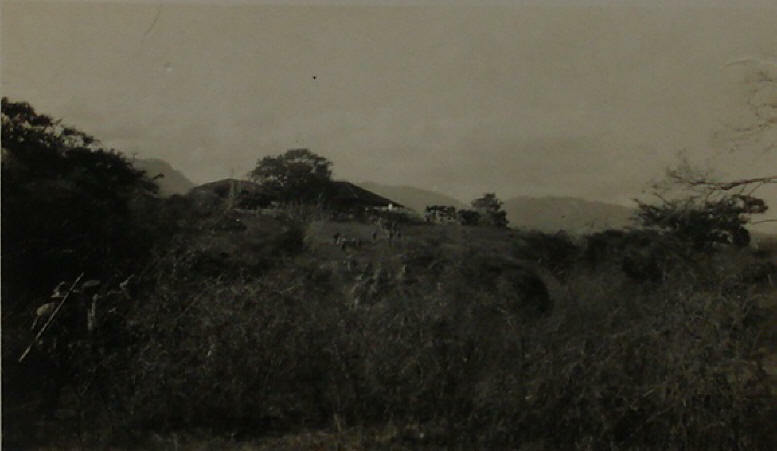 Marine barracks, Somoto, October 1928. 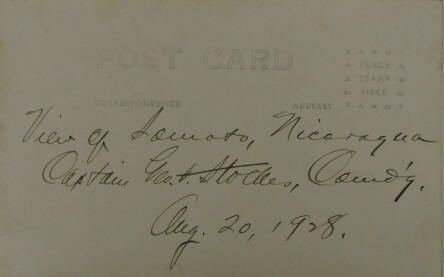 "Marine Barracks, Somoto, Nic Capt. Geo. 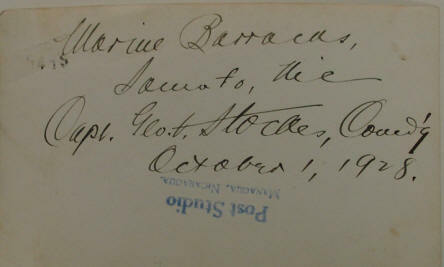 F. Stockes, Comd'g October 1, 1928." Photo MCRC-4.10. 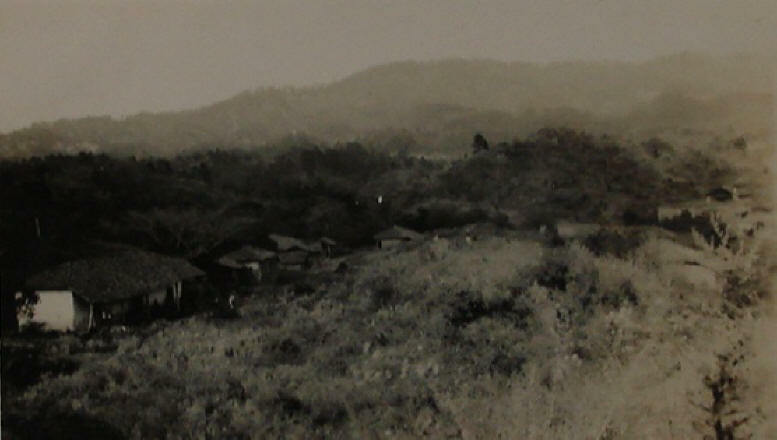 Somoto, with Somoto Mountain in the Distance, August 1928. 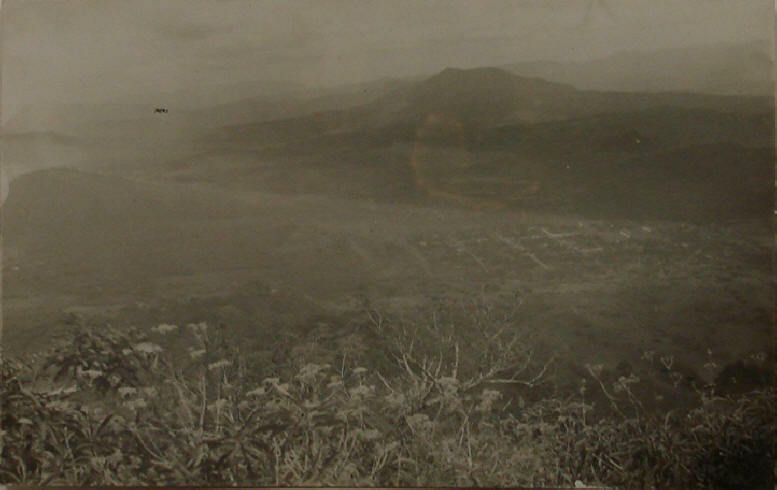 "View of Somoto, Nicaragua Captain Geo. F. Stockes, Comd'g. Aug. 20, 1928." Photo MCRC-4.11. 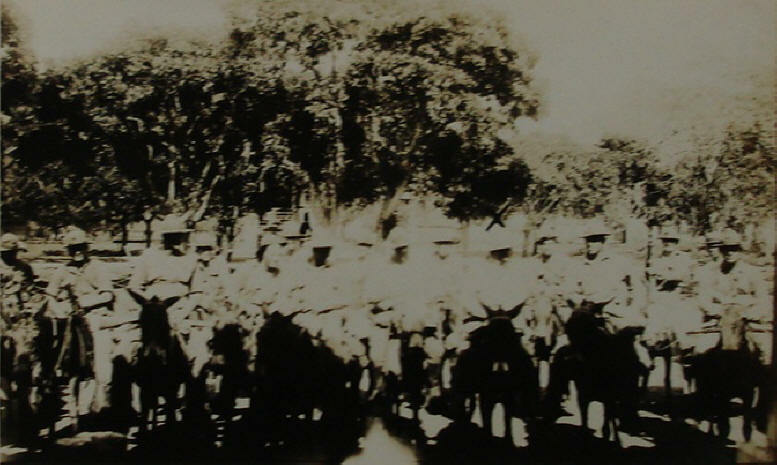 Mounted Patrol with Capt. Stockes & Lts. 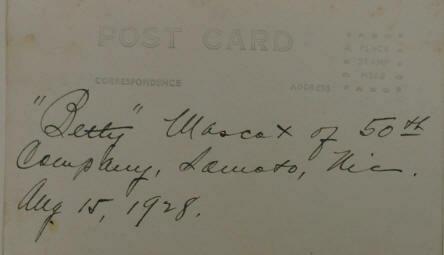 McHenry and Shaw, August 1928. "X -- me. Lieut. 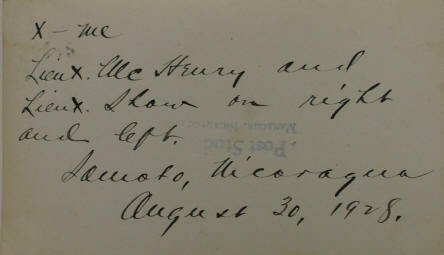 McHenry and Lieut Shaw on right and left. 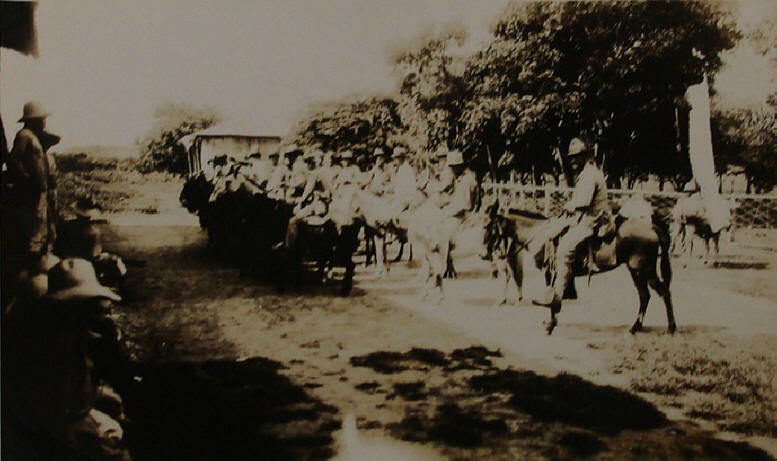 Somoto, NIcaragua, August 30, 1928." Photo MCRC-4.12. 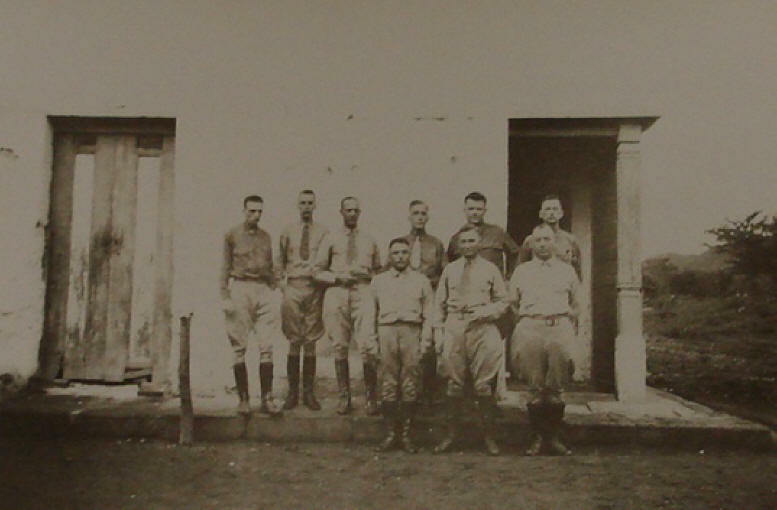 Nine Marine Officers, Somoto, July 1928. "First row -- Capt. Stockes, Capt. 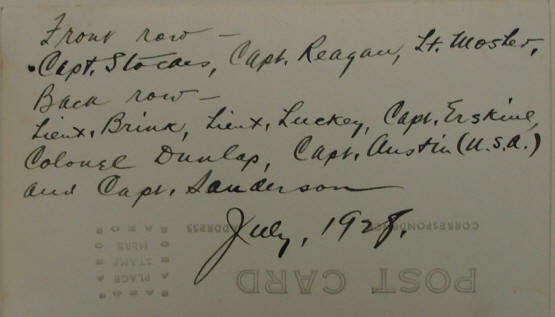 Reagan, Lt. Mosher. Back row -- Lieut. Brink, Lieut. Luckey, Capt. Erskine, Colonel Dunlap, Capt. Austin (U.S.A.) and Capt. Sanderson July, 1928." Photo MCRC-4.13. 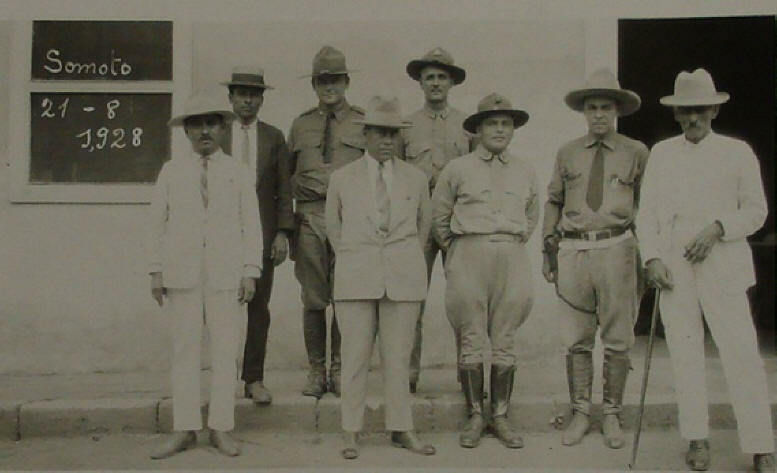 Four Marine officers, four Nicaraguans, Somoto, August 1928. 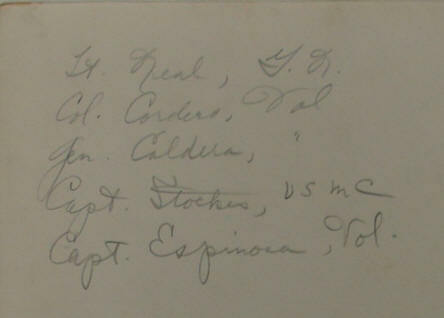 Four prominent local citizens and four Marine officers. Looks like Capt. 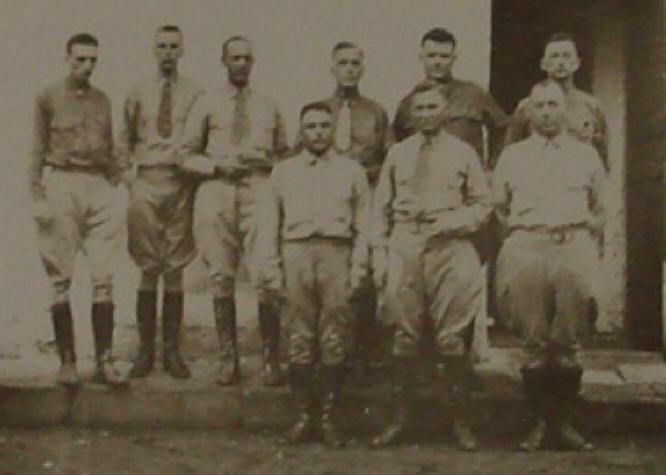 Stockes and Colonel Dunlap in the front row. Photo MCRC-4.15. 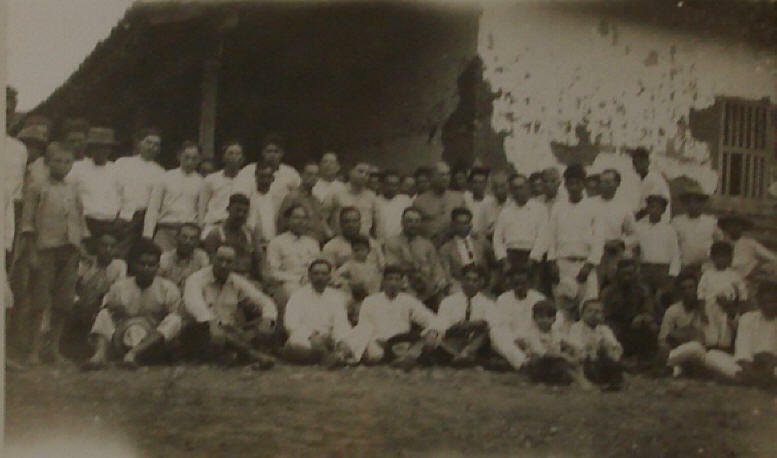 Voluntario Gen. Caldera, Col. Cordero, Capt. 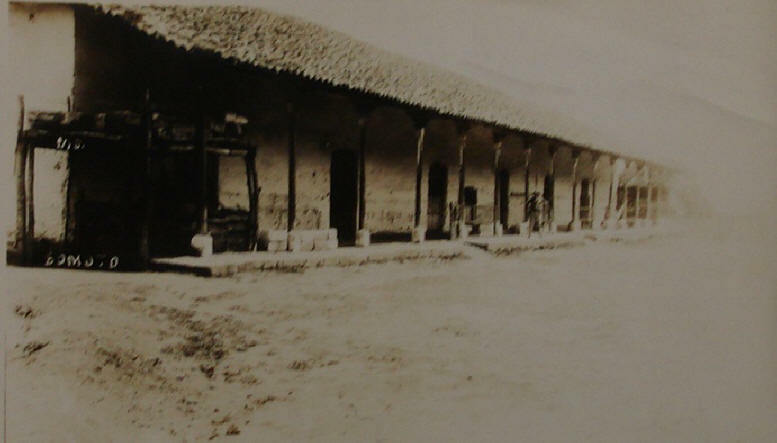 Espinosa, Somoto, late 1928. "Lt. Neal, G.M. Col. Cordero, Vol. Gen. Caldera, Vol. Capt. Stockes, USMC Capt. Espinosa, Vol." 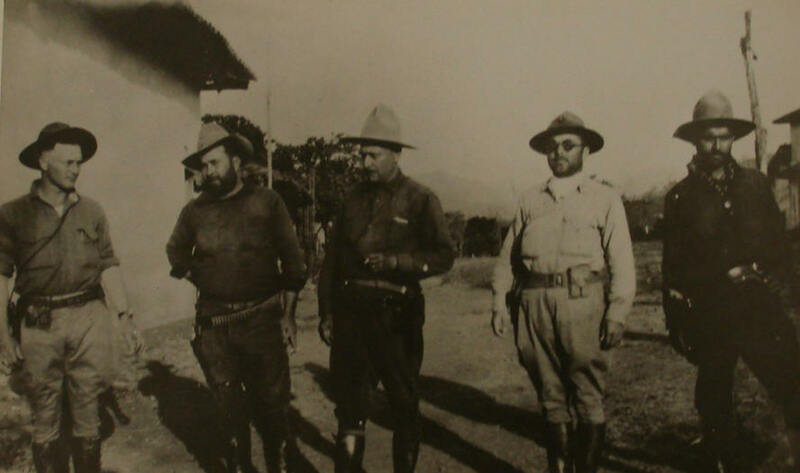 A great shot of three prominent Voluntario jefes -- a fascinating effort in late 1928 & early 1929 to privatize violence-making capacities to supplement the Guardia Nacional & Marines, and one that came to a quick halt in mid-1929 after things began to get out of hand. 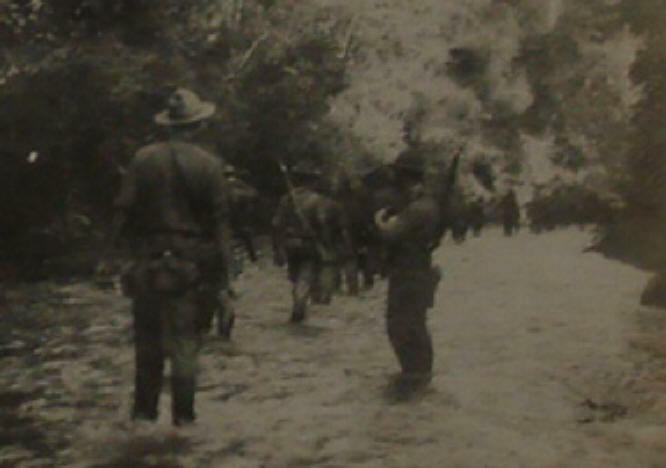 Despite the name, voluntario troops were paid pretty handsomely. There's an article waiting to be written on these guys.